These were some of the reflections from those present at the annual Farm-to-Table Gala that benefits Stony Point, the Presbyterian Church (U.S.A.) conference center about 45 minutes northwest of New York City. The Community of Living Traditions (CLT) is a multifaith residential community of Jews, Christians and Muslims who live and work together at Stony Point, helping to run the retreat and conference center while practicing and studying hospitality, nonviolence and justice. This year, the gala included a dinner made from food harvested from Stony Point’s land and other local farms. Stony Point expanded the size of acreage it is farming this year. In addition to having an acre on campus, Stony Point is now farming an additional acre and a half on a nearby family farm that had no one left to farm it. The Farm-to-Table Gala had added significance this year: It was held on the final day of the Jewish holiday of Sukkot, which celebrates the harvest. During the weeklong holiday, according to tradition, one was supposed to go out in the fields and build a temporary structure — a sukkah — and live in it. The CLT spent fellowship time in the sukkah they built, praising God for the abundance of harvest and for their Farm-to-Table Gala. On the night of the gala, as they do every year, they presented the Living Traditions Award to an individual or group that exemplifies one of their core values. 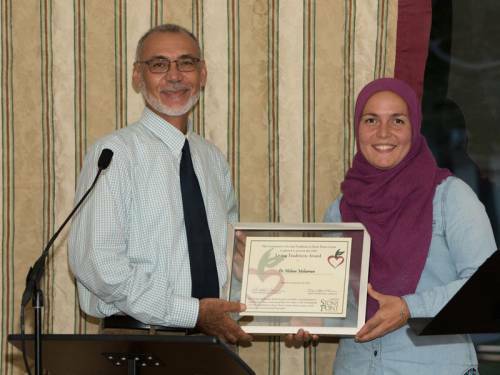 With the emphasis on earth care and the gala’s theme of “Seeding Food Justice,” the fifth annual award went to Hisham Moharram, who manages the Good Tree Farm of New Egypt, which is in New Jersey. Driven by his Muslim faith and trained as a scientist, Moharram founded the network of organic farms, which are community-owned and youth-operated. The faith-based agribusiness places great value on its farm produce being made available to the neediest and most disadvantaged in its community. Stony Point became aware of Moharram’s work earlier this year, when Stony Point farmer Amirah Abulughod met Moharram in the Newark airport, where they discovered they were going to the same “Faith and Farming” gathering in San Francisco. You have commanded us to love our neighbors, Lord. Soften our hearts and strengthen our resolve so we may do your will as Christ has taught us. Amen.